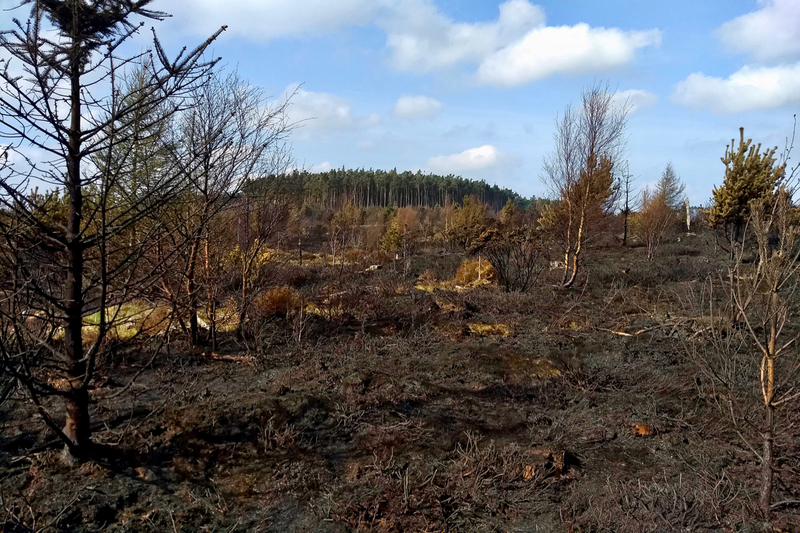 Took a trip up to Guisborough Woods to see for myself the devastating effect of Saturday’s fire. It covered an area of about 44 acres on an area of gorse and young spruce trees on the area known as “The Warren” above Cass Rock Quarry. Much was still smouldering but I suspect many of the trees will survive but may not be commercially viable. The more mature trees in the background somehow escaped in spite of the easterly wind. Facebook is awash with gossip about whether the fire was started deliberately. Blame has already been placed on local teenagers. Now I am no expert in fire investigation but, given the east wind, it doesn’t take much to suggest that the fire started in an area of very dense scrub next to the fields of Round Close Farm and some distance away from the more popular tracks. Not the sort of place to wild camp or hang out. But what do I know?